Musical Idustires Association in 2010. Robert (Bob) Paxman, MBE transformed Paxman Music Instruments from a maker of various instruments to one devoted to horns. Bob's father had established Paxman Musical Instruments – as the company is still known – as a maker of brass, woodwind, and percussion instruments in 1919. Bob began working there when he was just 14 years old. It was Bob Paxman’s partnership with an Australian horn player, Richard Merewether, that was to transform the company into one specializing in horns. Merewether arrived in England in 1950 with ideas about horn design – especially f-alto and F/f-alto horns. Paxman began producing instruments in line with Merewether’s philosophy, and the two men collaborated closely until Merewether died in 1985 – with around 50 designs to their joint credit. A modest and private man with a quiet, dry wit, Bob remained actively involved in horn design and was constantly looking to make design improvements. As recently as November 2010 – some time after his retirement as Managing Director - Bob was awarded a life time achievement award from the Musical Industries Association. 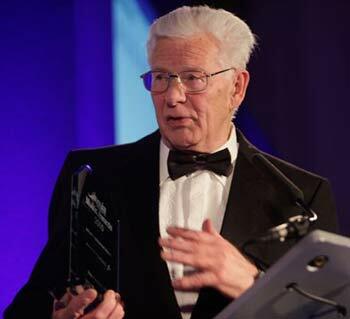 Bob was elected an IHS Honorary Membership posthumously in 2012.